A shamisen is a Japanese lute, an ancient three stringed, fretless instrument that is strummed with a wedge called a bachi. Kevin Kmetz is the only American to win an award in Japan for his mastery of the shamisen. So it's easy to see why his band God of Shamisen is our featured show this month. An ancient lute mixed with '70s/'80s prog metal? At first I imagined Kmetz in Japan beside his shamisen teacher in a holy temple, with reverent faces plucking calmly at their instruments, and then Kmetz suddenly jumping up to rock solo position wailing on the poor instrument with his teacher horrified. I thought how funny and ironic that would be, but then I read that the shamisen was often played with vibrant energy and a passionate fervor that at times reached a "violent" level (sans guitar-lip). Kmetz wanted to combine the energy of ancient Tsugaru Shamisen with the fire of modern metal, thus forming his anomalous act God of Shamisen. God of Shamisen isn't just a metal band, if leading with an ancient lute isn't enough to tell you that. 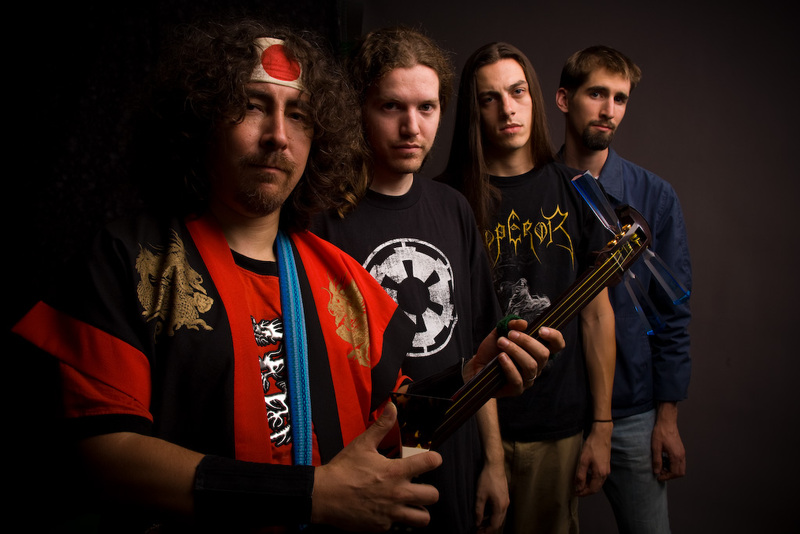 Like kindred acts Secret Chiefs 3 and Estradasphere (with which the band shares members) God of Shamisen is an ADD fusion of styles including funk, prog, and more. Drummer Lee Smith, performed at the Wormhole last May with the band Orange Tulip Conspiracy. Smith is from Atlanta but moved to Santa Cruz, CA in 2004 to join the band Estradasphere. He is back on this coast with God of Shamisen playing at the Atlanta JapanFest before heading to the Wormhole. Scarab from Atlanta is opening this Sept. 25th show with middle eastern influenced hard rock featuring strange rhythm driven soundscapes, some sludge metal riffs and angular math rock turns. Also opening this show are locals Sinister Moustache. We call them the Nightmare Cinema because of their film score style odyssey of fuzzy drug-induced hallucinations, exasperating chase scenes, and heavy metal nightmares. Their unusual blending of genres, from progressive rock and metal to jazz, ambience, and something that sounds a lot like Nintendo music, places them in a self-described "Metal-Fusion" category. These bands are all prog-fusion acts but they all have something different to offer. God of Shamisen is going to be big in Japan. The local quartet just finished up a West Coast tour with a CD release party on Friday night at San Francisco's legendary Bottom of the Hill club. With obvious glee, the band blew the crowd's mind with its patented blend of virtuosity, cheese, and sly irony. The shamisen, by the way, is a traditional Japanese instrument that resembles a three-string banjo with oversized tuning knobs, and is strummed with a plastic wedge that looks a lot like a windshield ice scraper. Kevin Kmetz plays the instrument with world-class skill, and could easily pack a world music crowd into the Rio for a contemplative night of traditional music if he chose. Fortunately for those who like to rock, he instead plies his trade with a prog metal trio -- Karl Schnaitter on guitar so slick it could wipe the floor with Steve Vai's sweat, Mark Thornton providing bass funk and occasional vocals, and metal monster Lee Smith slamming the skins. 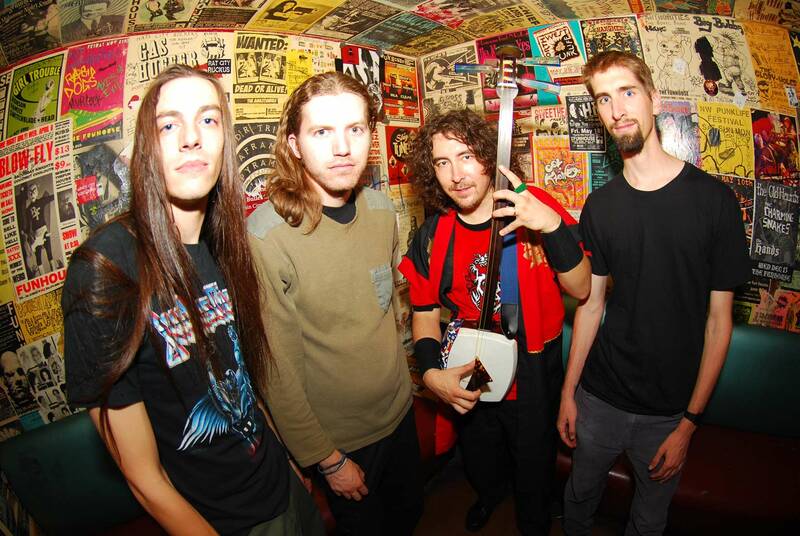 The resulting sound is a lot like Dragonforce minus the silly vocals, with songs careening about between head thrashing noise and pop-friendly hooks, often deliberately coming to a screeching halt before winding back up over a ten or fifteen minute length. It's not the most radio friendly fare, but who needs radio these days? And the inclusion of the shamisen has won the band a flowering fanbase in Japan, where the new CD is set for wide release soon if all goes well. 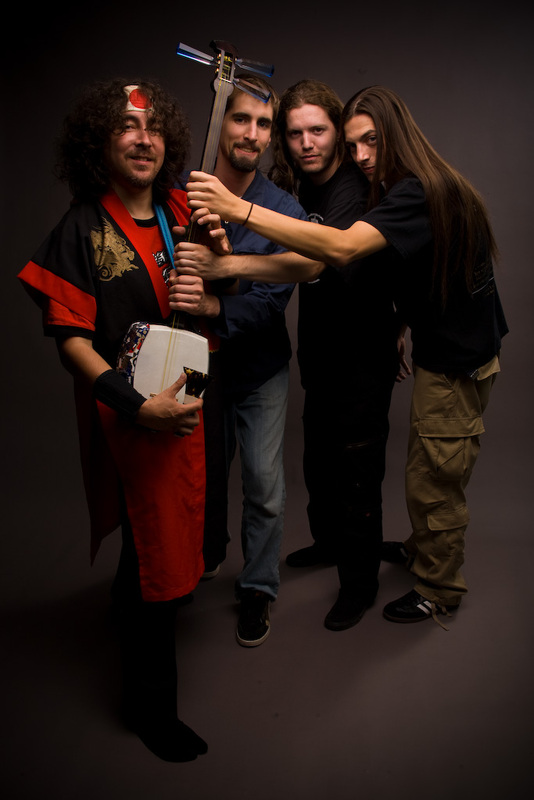 … The Santa Cruz four-piece is actually led by a true-to-life shamisen god named Kevin Kmetz, who dares bring forth the ancient three-stringed instrument into the mystical valley of ‘70s prog-metal. Kmetz is actually the only American to win an award in Japan for his mastery of the shamisen, which resembles a banjo and is played with a large plectrum called a bachi. 'Shamisen metal'… liek wtf? As one would type out loud on the internet. The Japanese instrument with the weird, huge plectrum seems as distant from metal as noodles to French fries. But it's a small world after all and these guys… prove it. Not that it's just metal, actually, if you're waiting for that you might be disappointed. The album's opener and title track pretty much sounds as what you'd expect. If you did expect anything, because the 'dry' sound of shamisen didn't sound particularly compatible with 'big' sound of metal, but it works out well. Like many genres they chose to tackle actually. You get anything. Indian bansuri flute and tambura drones (Traveler Attack), psychedelic freakout (Bad Dog Attack), eighties funk… right into to a Turkish song (Beyoglu Parade Attack, starts out somewhat electronic which reminds of 'synthetic bellydance' of Alamooga Esinlenmeler, although it ends more like a Giant Robot attack through Buckethead). So, you get the picture, I guess. All these things are combined nuggets that rock hard enough to make it relatively easy to digest for anyone, even if you're not to well-versed in the musics of the orient. Only a few times things get a bit silly, to be precise: the 'vocals' in Ripe Fruit Attack weren't really needed if you ask me, except for talkbox and the r'n'b girl that is, those are fine. The reggae in Bad Dog Attack (with funny voices again) isn't too successful either. Otherwise this is definitely going to be appreciated by Estradasphere-fans. This is not music that will radically change the world, but it does make it a bit smaller and more fun. In other words: God Of Shamisen attack! If you’re into the fusion of metal with traditional Japanese music (and who isn’t? ), pick up Dragon String Attack by God of Shamisen. Shamisen master and Estradasphere member Kevin Kmetz leads the group with his acrobatic finger work on the fretless Japanese instrument, infusing said sounds with any other genre that feels appropriate (reggae, Gypsy, jam rock, funk). The shredding riffs of guitarist Karl Schnaitter and the detonating beats of fellow Estradasphere cohort Lee Smith also propel the band, which you know will be good given that two of Kmetz’s listed influences are ultra-heavy death metallers Cryptopsy and classical legend J.S. Bach.. 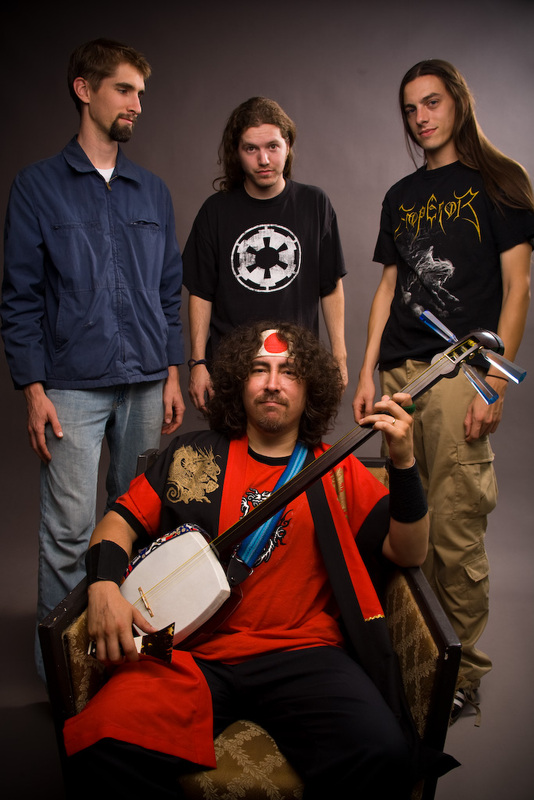 It's possible the Santa Cruz quartet God of Shamisen is the world's first quasi-metal band led by a shamisen (a Japanese three-string lute) player. It's also possible no one saw this particular East-West fusion as one that had to happen someday — but these guys have taken the initiative and made it happen regardless. Their genre-surfing sound not only takes on death metal and Japanese folk, it veers into the realms of videogame music, cheesy white-guy funk, and '60s soundtrack influences. Shamisen player Kevin Kmetz and drummer Lee Smith are also members of the band Estradasphere, and GoS brings a similar blend of impressive chops, eclecticism, and (occasionally) numb-nuts humor to the table. Sunday's music opening set featured returning band Akai SKY (www.akaisky.com) and first timers to Fanime, God of Shamisen (www.godofshamisen.com]. Both inspired by Japanese roots (if from different angles), Akai SKY from modern Japanese bands, and God of Shamisen from traditional shamisen to video games, anime themes, and even metal. Our second band brings together not only a diverse sound but also its instruments. Lead by Kevin Kmetz playing an electric version of a traditional shamisen, bassist Mark Thornton, drummer Lee Smith, and Karl Schnaitter playing guitar. Their set included familiar greats like the theme from FFXII and the opening to Sailor Moon. As a personal favorite of the set, "For Whom the Bell Tolls." They have succeeded in bringing the shamisen into a whole new appreciation to many who have experienced something different from the norm. More information about them can be found at godofshamisen.com, or check out YouTube.com and search for "Monsters of Shamisen". A prophet without honor in his hometown? Santa Cruzans may find it easy to take Kevin Kmetz for granted, since he can so often be found kicking out the jams on his trusty shamisen at the corner of Cooper and Pacific. But Kmetz is definitely big in Japan, where he captured second place in the national Tsugaru Shamisen Tournament this past spring. For those who've only seen him on the street, God of Shamisen may be something of a revelation, as Kmetz leads considerably more amplified forays into prog, funk and metal—realms where few shamisens have gone before—all with the backing of drummer Lee Smith and bassists/guitarists Dave McCoy and Mark Thornton. Foxycock and the Sundowners round out the bill. Great Masters Of Modern Shamisen is a creative compilation from Kevin Kmetz showcasing new works by some of today's most celebrated Shamisen masters. God Of Shamisen perform a brilliant track called "California Burrito Dog Attack! ", "The Kidnapper" features Fishtank Ensemble together with guitarist El Douje, and "Mary Jane" is another incredible song scripted by vocalist Danyl Johnson. This CD also contains several original songs from Tsugaru Shamisen protégé Mike Penny. Kevin Kmetz also covers the legendary Baroque composer Johann Sebastian Bach's "Toccatta". Right here in Santa Cruz, eastern and western musical styles are meeting up … and kicking the living crap out of each other. In the band God of Shamisen, world music, rock and heavy metal take each other to the mat, spurred into action by the sound of a three-stringed Japanese lute called the shamisen. Sounds weird? Well, yeah. It’s weird in the way that green tea ice cream is weird: different, but enticing, and eventually habit-forming. As one might expect, the pioneer of this new musical form, 33-year-old Kevin Kmetz (also of Estradasphere), is half American and half Japanese. As a Western-trained musician who happens to have grown up in Japan, he’s taking his dual heritage to its gloriously illogical extreme—and in so doing, reinventing both shamisen playing and rock music. "[In Northern Japan,] I would go to these festivals when I was a kid," he explains. "I would see these shamisen players, and they’d just be playing really hard and really fast. It reminded me of a lot of the metal that I was starting to get into at that time, and I noticed that there’s never been a really good example of that kind of fusion." Given that the particular style of shamisen playing in which Kmetz is versed—Tsugaru Shamisen—is based on a tradition of constant reinvention, he finds himself in the paradoxical position of conforming to convention by breaking the mold. In this case, that means adding death metal drums and electric bass and guitar to the Tsugaru Shamisen format. While there’s no questioning the level of skill with which it’s played, this new idiom—California Tsugaru Shamisen—is downright savage in its intensity. 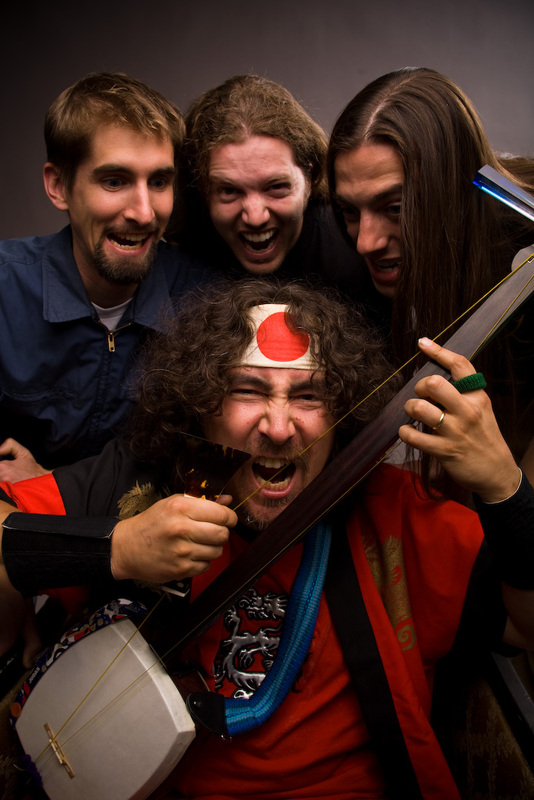 The fierceness of the band’s attack is expressed in the name God of Shamisen, which, while somewhat tongue-in-cheek, is designed to let audiences know they’re in for a no-holds-barred rock experience. Kmetz explains that God of Shamisen was actually the nickname of Shirakawa Gunpachiro, a musician considered to be the best shamisen player in the world until his death in the 1960s. "There’s a way of looking at it like ‘The God of Shamisen’ is the main influence sitting over our band instead of something external," suggests Dave McCoy, the bassist for the band. "An inexplicable force behind every note," drummer Lee Smith (also from Estradasphere) adds with exaggerated pomp. "We can’t control it." Such comments aren’t far removed from those of shamisen players of old, who tended to ascribe supernatural properties to the music. Kmetz explains that Tsugaru Shamisen’s first audiences were confused by the new style because of its incorporation of improvisation, an element alien to most of Japan at the time. "The only way [the musicians] could really explain it to the mindset of that time was to say, ‘Well, I’m emptying myself, and the gods are coming and playing through me. I open myself to the spirit world,’ which, in essence, is what any musician does every time they improvise." It’s easy to imagine shamisen purists being every bit as bewildered by God of Shamisen’s multi-stylistic mind-hump as those early audiences were by Tsugaru Shamisen, but according to Kmetz, all’s quiet on the eastern front. "I’ve been a little disappointed, because I haven’t had any really bad reactions!" he laughs, adding that he’s waiting for the day when he’ll be pelted with rotten produce. Careful what you wish for, Kevin. Santa Cruz is listening. In keeping with his half-Japanese, half-American heritage, local artist Kevin Kmetz has created an idiom he calls California Tsugaru Shamisen — a smelting of traditional Japanese shamisen playing with just about every musical style under the western sun. His CD of the same title is an intensely creative effort that unites several of Kmetz’s recordings with his various bands. The album’s first song, “Ringo Bushi,” ostensibly sets the listener up for a placid, hour-long tea garden tour, leaving you wide-eyed when the Kamikaze Klezmer-rock mindf**k of track two, “The Last Shamisen Master,” leaps from the bushes with a well-placed roundhouse kick. “Dragon String Attack” follows with a vicious metal/World Beat avalanche courtesy of Kmetz’s group God of Shamisen. The same band’s “Lions Always” sets an anti-consumerism sentiment to a monstrously catchy tune, making for what may be the album’s crowning cut. Social critiques abound on Shamisen: There’s the near-genius Zappa sarcasm of “Miasma,” D. Johnson’s shrewd hip-hop slam “Damn!” and David Potter’s “Gasoline,” which gives Golden Earring’s “Twilight Zone” a Jamaic-over and sends it to anarchist’s camp. Estradasphere’s “Mekapsis Yitonisa” does a Mexican jumping bean dance across your nerve endings in typical hyperactive savant fashion, and the aptly named “Colision de Mundos” by el douje is a surprisingly cohesive mound of Gypsy guitar leads, squishy ’70s-prog keyboard tones and trance pulses. With straight Japanese folk tunes like “Yasaburo Bushi” and “Holly’s Song” rounding out the set, Shamisen manages to scald, bruise, soothe and amuse, all within a cool 55 minutes. 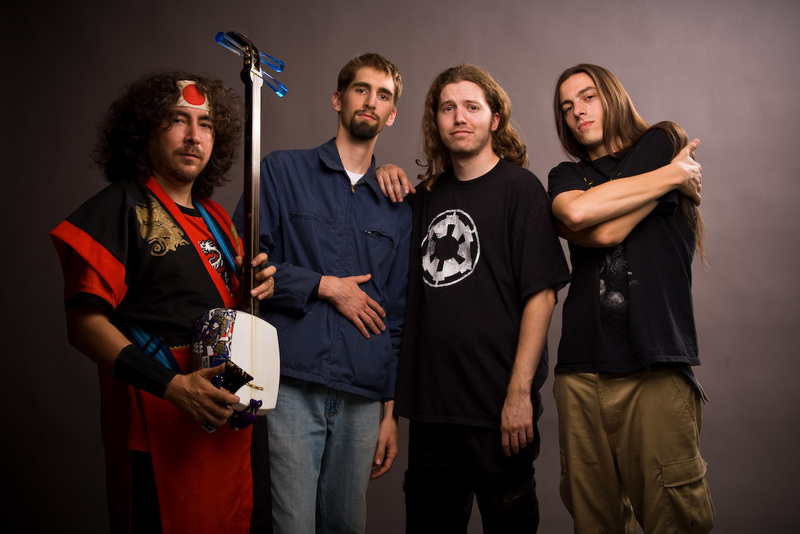 God Of Shamisen is a prog-rock funk-fusion band from Santa Cruz, California, who are responsible for pioneering a new style of California Tsugaru Shamisen in the twenty-first century. 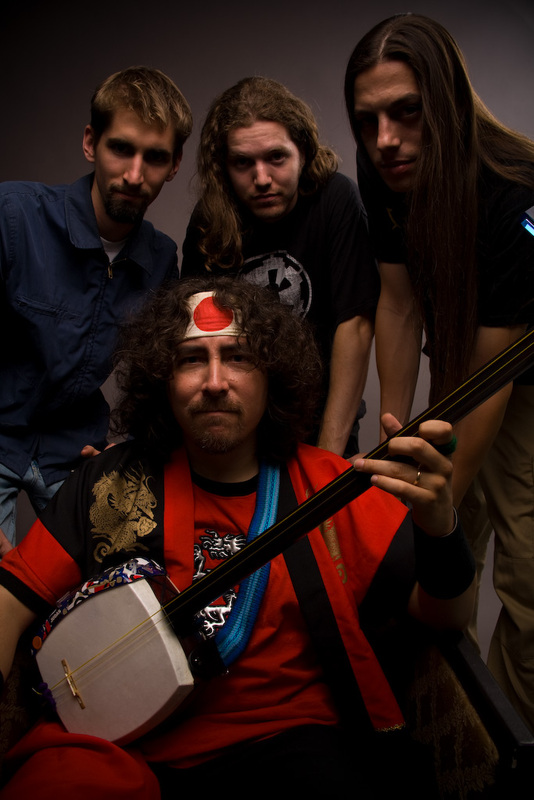 The band is fronted by Shamisen virtuoso Kevin Kmetz, who plays the Tsugaru Shamisen, and the Mugen 21 Electric Shamisen. This three-string lute-like instrument originates from the Tsugaru region of Northern Japan. It is usually performed in a folk style, yet the Spirit of Shamisen is often compared to jazz, especially when approached from an improvisational perspective. Kevin Kmetz has produced an illustrated history of Tsugaru Shamisen for those interested in learning more about this fascinating musical instrument. In addition, Daijo Kazuo's book The Birth Of Tsugaru Shamisen Music provides comprehensive information on the creative marginality that stimulated Shamisen popularity into one of the most loved traditional instruments in Japanese culture. 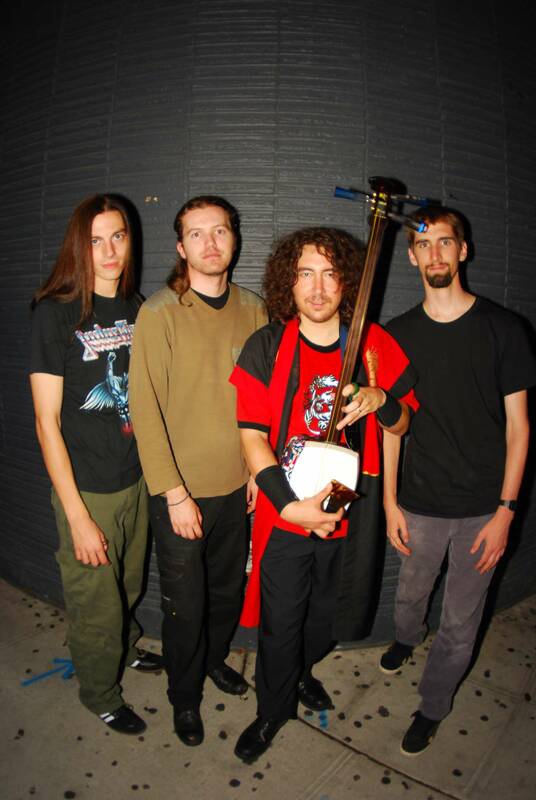 God Of Shamisen is Kevin Kmetz [Shamisen], Mark Thornton [Guitar & Bass], Dave McCoy [Guitar & Bass], and Lee Smith [Drums]. During their rare live shows, band members often encourage musician friends to join them for special guest appearances. These opportunities provide a perfect platform to explore new territory in creative live performances. God Of Shamisen members have also experienced diverse musical terrains by recording releases with Secret Chiefs 3, Estradasphere, El Douje, and the Fishtank Ensemble. Kevin Kmetz also performs lively Shamisen music with bilingual storyteller Megumi, plus he provides private lessons and group workshops to students of Shamisen. More Shamisen-influenced music can be discovered through the Japanese bands Yoshida Brothers, Hiromitsu Agatsuma, and Jammin' Sensu. 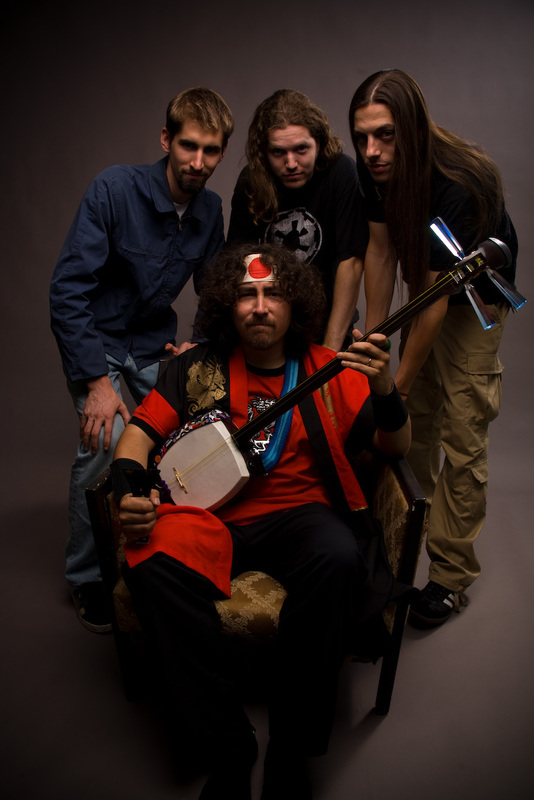 God Of Shamisen have drawn their inspiration from many Tsugaru Shamisen masters, namely Takahashi Chikuzan, Shirakawa Gunpachiro, and John Zorn-collaborator Shinichi Kinoshita. God Of Shamisen compositions are available on the California Tsugaru Shamisen release, recorded in early 2005 at the Estradasphere studios in Soquel, California. 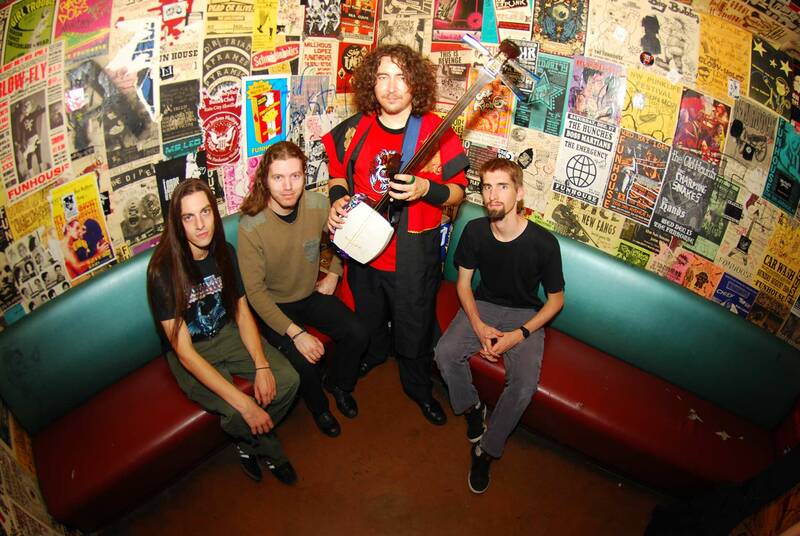 Fishtank feature two tracks, "Ringo Bushi" and "The Last Shamisen Master", from their debut release Super Raoul. Secret Chiefs 3's "The 4 - Great Ishraqi Sun" is taken from their fourth album Book Of Horizons, and Estradasphere's "Mekapsis Yitonisa", based on the traditional Greek composition "Kalamatiano", that introduces their fifth release Quadropus on Mimicry Records. 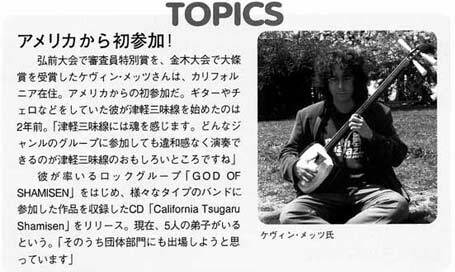 The California Tsugaru Shamisen album also features Flamenco guitarist El Douje contributing his composition "Colision De Mundos" from the accomplished album Worlds Collide. God Of Shamisen anticipate producing their own full-length album and introducing the world to their cross-fertilization of traditional and contemporary styles. Justin Sanvicens from Xtreme Music received responses to an e-mail interview with Kevin Kmetz on June 9, 2005. 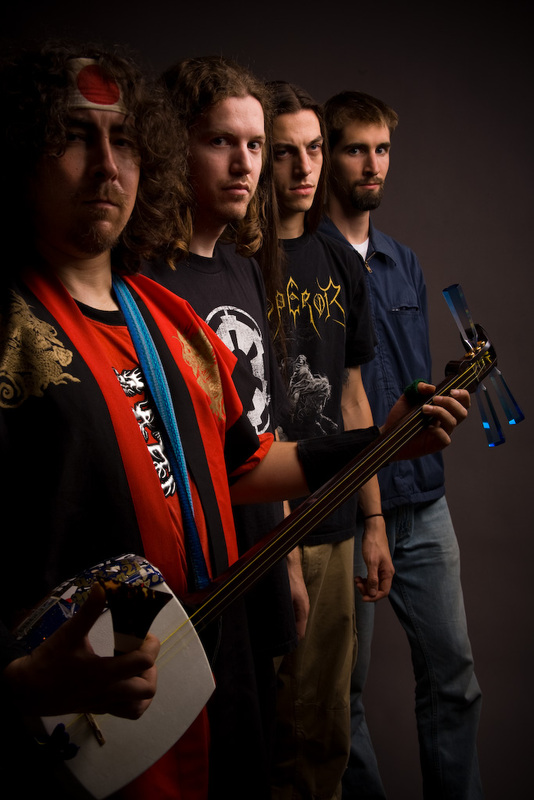 Xtreme Music: God Of Shamisen are pioneering a new sound in the Santa Cruz musician community. How exactly did God Of Shamisen form, and when did you start working together as band? Kevin Kmetz: Since I was a teenager I noticed that Tsugaru Shamisen was a truly "powerful" music. The ferocious style in which the Tsugaru masters strike the strings sometimes reaches a "violent" level! For years I wondered how it would sound to combine the power and passion of Tsugaru Shamisen with the fire and fury of modern metal. To do this I realized that the key element for making it work would be the relationship between the Shamisen and the drums. I have always been a huge fan of death metal drumming and had a strong desire to hear this style with my Shamisen playing! 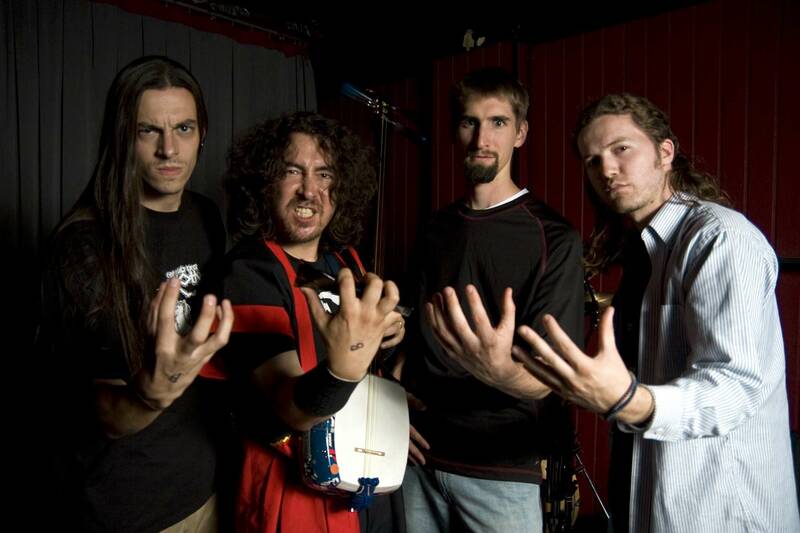 I searched for quite a while and then suddenly in 2004, as if like an answer from the Gods, a talented and energetic drummer named Lee Smith from Georgia moved right next door to me to join and work with the band Estradasphere. Once Lee arrived I knew I would have to ask him to help me form history's first Shamisen based rock band in America!.. Many years ago I lived in Southern California, during that time I met a talented young musician named Dave McCoy. We remained friends for years and later we both ended up moving to Santa Cruz. Dave and I already had quite a few jams and grooves we had been throwing around so when forming the band it was easy to find material to build from. Dave and I got together and worked out the first God Of Shamisen set, about a twenty to twenty-five minute set, in about one or two evenings. From playing in the Santa Cruz based band Estradasphere I also got to know Mark Thornton who did a brilliant job with the Estradasphere DVD "Passion For Life", and often did projections and other effects for live shows. One day Mark was throwin' down a jam on the bass guitar. It was like a funky thing in some harmonic minor key. There was something to it! I heard it and I said "Wow! you know... we should all make this band and call it God of Shamisen!" We officially formed in the Fall of 2004 and had our first show in Santa Cruz! Xtreme Music: Please tell us about the writing processes involved in God Of Shamisen's original compositions. Kevin Kmetz: Dave McCoy and myself will often sit down and go over grooves until we find something kind of wacky to throw in, or come up with some kind of melody or theme. I really like the idea of creating a series of themes or tunes, and having them all relate somehow in the end. The song "Dragon String Attack!" is actually much longer than it appears on the CD. The entire piece is a departure and return to the main neo-classical Japanese-rock theme that kicks in at the start of the song. At the very end we do a long build up and bring that same theme back in a climactical-rock fashion. Other lesser themes are also coming in and out of the composition as it develops. The effect is similar to following a good story with characters developing and transforming throughout their experiences. Xtreme Music: What innovative production techniques does God Of Shamisen incorporate into your recorded music? Kevin Kmetz: There is actually nothing too innovative about what we have done so far in the studio. It has pretty much been a combination of direct inputs and standard micing. I did do some overdubbing but most of it is straight forward, like when we play live! Xtreme Music: "Dragon String Attack!" is one of my favourite songs from God Of Shamisen. Please share some details on how this song was recorded in the studio, and how it's been received during live performances? Kevin Kmetz: We all played through the track with the Electric Shamisen going direct into the computer. Later I went back and overdubbed the entire Shamisen part into a mic. The final recording is a combination of both. there are some keyboard samples in there as well, towards the end. It is one of our favorite songs to play live, and almost always results in someone in the audience screaming at the top of their lungs with a mixture of sheer delight and terror as the sound of death-Shamisen rips through their soul for the first time!!! Xtreme Music: The band often invite guest musicians to join you for live appearances. How have your live performances been going, and what has the crowd reaction been like? Kevin Kmetz: Our guests have ranged from rappers to shredding guitarists. We are also hoping for Accordian and Violin guests to join our shows. Adam and Timba from Estradasphere, and anyone else who wants to rock with God Of Shamisen! I am personally looking forward to doing a few things with vocals in the future. Our live shows have been a blast so far! Of course we have had good and bad shows. One of best was the other night at a place called the Aptos Club [May 22, 2005 Aptos (CA), Aptos Club]. We rocked that place silly..
Xtreme Music: God Of Shamisen features a fusion of traditional and contemporary styles. Who would you say are your main influences, and how have they shaped your musical direction? Kevin Kmetz: For Shamisen my biggest influence and inspiration comes from my teacher Akihito Narumi, leader of the eclectic Japanese ensemble called Shirakami. I would also like to mention some of the new generation of young Shamisen heroes who have inspired me, and who are now making waves in Japan's ever evolving popular music scene: Asano Sho - winner of Japan's 2004 and 2005 Tsugaru Shamisen championship tournament in Hirosaki City, the Shibatta Kyodai - one brother and two sisters with unbelievable Shamisen virtuosity, and Kaoru Osanai - leader of the underground Shamisen metal scene in northern Japan. Xtreme Music: The performance and sound of the Shamisen has historically been associated with alternative states of consciousness, and even submission to the spiritual realm. How does your performance style of Shamisen reflect or differ from this perspective? Kevin Kmetz: I think the name of the band itself is somewhat a reflection and tribute to this aspect of the instrument. When Nitaboh, the blind Shamisen player first created Tsugaru style Shamisen he developed his training methods by becoming involved in the Shamanic arts of Northern Japan. In the Tsugaru region the art of the Itako, a specific type of shamanism was banned and many of the female practitioners were forced to give up their art and go into marriage with various men. Nitaboh married one of these female shamans and from her learned the secret arts of the Itako Trance. In this state it is said that one empties oneself eventually becoming a vessel for the Gods and Spirits to speak, move, or play through. Tsugaru Shamisen is therefore an art born from the altered "trance" state of the Northern Japanese Itako shaman! In God of Shamisen we have done things here and there in our live shows to reflect this aspect as well. One thing we used to do on stage was to suddenly stop playing music completely and sit down in a meditative state while rubbing metal bowls with a wooden stick to produce a strange ringing effect. We would do this for exaggeratedly long periods of time sometimes just to confuse people! Xtreme Music: "California Tsugaru Shamisen" features collaborations with El Douje, Estradasphere, Fishtank, and Secret Chiefs 3. What has it been like working with each of those bands? Kevin Kmetz: I had been a huge fan of Estradasphere before joining the group so it is extremely thrilling to perform with these guys! The same goes for Secret Chiefs 3. El Douje is another amazingly talented musician who also plays in Fishtank. I definately owe the development of the new California-style Tsugaru Shamsien to these groups. Having shredders around you constantly is definately an inspiration for anyone seeking do develop his or her musicianship. Xtreme Music: Your music has featured on several releases for Trey Spruance's Mimicry Records. How did you first meet Trey Spruance, and what experiences can you share from working with him in both a studio and live context? Kevin Kmetz: I first met Trey Spruance through Estradasphere. The first day I went up to his place to record I remember planning to meet him around noon. We ended up sitting around talking and drinking an extremely strong Turkish coffee for about 5 hours and finally around 17:30 started recording. I had never really worked with quarter tones before that time, and I remember how I had to put some tape on the back of my Shamisen's fingerboard in order to locate them all! Xtreme Music: For those who enjoy God Of Shamisen, what essential music recommendations can you provide? Kevin Kmetz: Besides Kaoru Osanai there really is not too much out there in the area of Metal Shamisen. However, if you just like the sound of Shamisen and want to hear some of today's top players I can recommend Hiromitsu Agatsuma, Shinichi Kinoshita, Shirakami (with my teacher, Akihito Narumi). Nitta Oyako, featuring Masahiro Nitta and Hiroshi Nitta, who played the Evil Shamisen Lord in Japan's recent major motion picture release called "Overdrive"! If you are interested in the old school "Traditional" Tsugaru Shamisen there are a whole list of masters who have released records. Takahashi Chikuzan is probably one of the most prominant. If you can find recordings of Kida Rinsho, Shirakawa Gunpachiro, Fukushi Masakatsu, Mihashi Michiya, or Yamada Chisato, you have struck gold in the realm of the Shamisen Gods! Xtreme Music: What are your plans for projects and musician collaborations in the near future? Kevin Kmetz: I am currently planning a new CD for release in 2006. This will feature new God Of Shamisen material and many collaborations with various artists around the San Francisco Bay Area. But my biggest current project is teaching. I am attempting to get people interested enough in this instrument to try it out for themselves, and am hoping that someday people will look back at this time of creation in the same way that we are now looking back at Nitaboh and his followers. Just as Nitaboh created a new style of Shamisen on the streets of Tsugaru, I hope someday people will celebrate the further development of the Shamisen as it existed on the streets of California, USA in the early part of the 21st century!